We pride ourselves on our happy customers at Union Street Dental Care. Have a look below at just a few of the testimonials we've received to date. 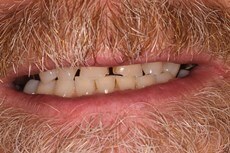 The patient's main concern was her diastema (gap between front teeth) Our patient was over the moon with her results. 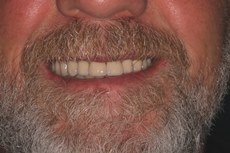 Patient attended as he was unhappy with the appearance of his teeth and smile. He opted for a complete smile makeover and as you can see from the result both Lee Strachan the dentist and James are delighted with the results. "Thank you for allowing me to smile again. My new denture has given me a new found confidence." This patient presented with heavily carious teeth which, unfortunately could not be restored. "I have just had a bridge fitted today and I am absolutely over the moon with the result. Lee Strachan made the experience no problem at all." "As a patient of Union Street Dental Care, my nervousness is no longer an issue." "I am absolutely delighted with the miracle that you performed on my mouth. I am thrilled with my new teeth. It has been a life-changing experience for me. I can smile, talk and feel at ease in company. I sincerely hope that you all realise the sparkle that you have brought into my life." "I'm a nervous person and don't always like coming to the dentist, but everyone's so friendly and immediately put me at my ease that it's becoming a pleasure to come to the dentist."